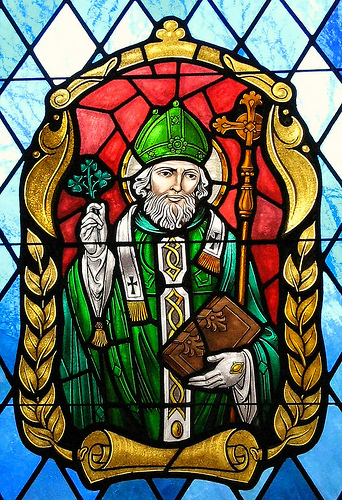 Why do we celebrate Saint Patrick’s Day? 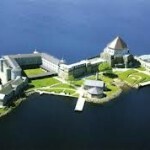 St Patrick’s Purgatory | Lough Derg is a unique island of deep prayer and a living part of Irish Christian Heritage. St Patrick himself was called to the island. 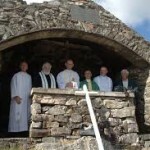 Pilgrims have been travelling to the sacred site on Station Island, County Donegal for centuries. The small island is set in calm lake waters where there are no distractions or interruptions making it a conducive place to go into deep prayer and to get closer to the authentic self. 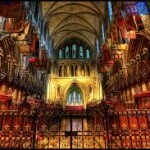 A place of worship, Saint Patrick’s Cathedral was built in honour of Ireland’s patron saint. The Dublin cathedral stands adjacent to the famous well where tradition has it Saint Patrick baptised converts to the faith on his visit to Dublin. County Down Cathedral stands on the site of a Benedictine Monastery built in 1183. 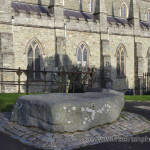 A stone in the graveyard in 1900 commemorates Saint Patrick’s burial place is on the hill. The memorial stone is a slab of granite from the nearby Mourne Mountains. Crosses from the 9th, 10th and 12th Centuries are also preserved in the Cathedral grounds. The tradition of the hill being the burial place of Saints Brigid and Columcille gives rise to the well-known couplet: In Down, three saints one grave do fill, Patrick, Brigid and Columcille. 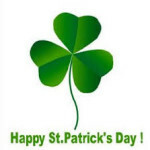 Tradition has it that in year 5th century Patrick arrived in Ireland bringing the Faith. He was brought to Ireland as a slave, and during his years of captivity he spent much time in prayer. After six years of slavery and hardship Patrick tells of a dream in which a man named Victoricus brings him a letter headed ‘The Cry of the Irish.’ We are told that Patrick was given a barn in Saul as his first church by the local chieftain, Dichu. The present Church of Ireland church at Saul, 2 miles distant from Down Cathedral was built in 1932 to commemorate the fifteen hundredth anniversary of Patrick’s arrival. Croagh Patrick aka Patrick’s Mountain. In Irish it’s spelt Cruach Phádraig. 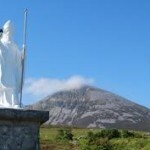 The 2000ft mountain is an important site of pilgrimage in County Mayo. It’s been a site of serious pilgrimage for years and years. It is a challenging, unique and the magnificent landscape to climb. A site of early Pagan pilgrimages, summer solstice gatherings and now Christian Buddhist and Catholic pilgrimages. Thousands of people climb the mountain every Reek Sunday, the last Sunday in July. Croagh Patrick is associated with St Patrick, the Aposlte of Ireland. He is reputedly to have fasted on the summit for forty days in the 5th century A.D. From St. Patrick’s own time there had been some sort of a little chapel on the summit called “Teampall Phadraig”. Remains of a foundation have been found, and in 1905 a small chapel was built on the summit. The little church is open every day during the summer, and mass is celebrated in the church on Reek Sunday and on 15 August. It takes about 3 hours, depending on fitness, to climb to the summit where the breeze, the Spiritual vibrations and views are magical. Magical unspoilt scenery, dramatic valleys, forests and harbours make an incredible setting for a Spiritual pilgrimage, the Gaelforce adventure race, mountain biking or hill walking for a more gentle style! Thirty miles away from Croagh Patrick the lesser known Mámean pilgrim site dates back to the 5th century. At the summit of the Maum Turk Mountains in Connemara there is a natural rugged passage way known as Máméan – an ancient pilgrim site dedicated to St. Patrick. Legend tells of how St. Patrick on his travels through Joyce Country climbed Mámean and gave Connemara his blessing. Pre-dating this time it is also associated with the Lughnasa Solstice festivals. Like many pagan sites it was Christianised, evolving into Reek Sunday – the last Sunday in July or the first Sunday in August. The site is marked by a holy well, St. Patrick’s Bed – a cleft in the rock and a circle of stone crosses represent the Stations of the Cross. Completing the shrine is a Mass Rock – used during the eighteenth century penal times when Catholicism was outlawed. A small chapel was built beside St. Patrick’s bed, and a statue of St. Patrick depicted as a shepherd with a sheep at his feet. Today a pilgrimage takes place three times a year on St. Patrick’s Day, Good Friday and the first Sunday in August. A variety of objects are left behind as offerings.